The 22'W x 24'L x 12'H Two Car Steel Carport is ideal for protecting up to two vehicles from the elements, and can withstand a massive amount of snow and ice build-up. The open design allows for excellent ventilation, without sacrificing protection. The Rhino Shelter 22'W x 24'L x 12'H Two Car Steel Carport offers superior protection from the sun and other natural elements, and is large enough to accommodate two vehicles. The roof features fluted steel sheathing with a neutral colour finish, which is baked-on. The steel panels are rust-resistant and provide exemplary UV-protection. The sheets are cut to length before shipping, and attach to the frame using self-drilling rubber grommetted screws. 30" long steel pin anchors with large heads are included in the package and allow the carport to be installed on virtually any kind of surface. Frame bases are pre-drilled for secure anchoring. 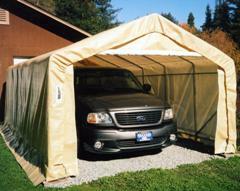 Easy to assemble, the steel carport is rugged enough to be a permanent structure and durable enough to last years.